I started it last June. It is the first major creative project of my sabbatical, and a leap of faith. I rolled it up in a tube and put it in my suitcase last July, thinking I’d finish it in London, when the weather turned cold and rainy in the Fall. But the weather was uncharacteristically good in London, plus there were just too many things to see and too many people to meet. It stayed in that tube all during London, and Barcelona, Lisbon and Portugal. It didn’t emerge from the tube until Dublin, in January. The weather in Dublin was perfect – rainy, cold, gray, and very very windy. All the better to stay inside and finish that map! When I removed it from the tube, I had to lay it flat for a few days so it could uncurl a bit. Even though the base drawing was there, it seemed like a blank sheet to me. While I worked on it, I realized I still had many decisions to make. Much of it was inked in before I left Portland, Maine, and I knew applying the color would bring the story to life. I refined my ideas for the various “Detroit” motifs I wanted to use – broken glass, the language of “the car” and the architecture. Illustrations done, working out overall color. Filling in text and other detail. The Detroit River was too dark, it's lightened here. The corners of the border are Pewabic tiles from the floor of St Agnes. From Portland to Dublin, the process. Back in 2015, when I was in the abandoned Fisher Body Plant 21, the light inside struck me. Everything had a beautiful blue-ish green hue. Some of the walls and columns were painted green, and there was a lot of the original blue glass in the windows. I wanted to capture this in the palette. Apparently Ford thought that blue light would have a calming affect on the workers. This blue is also quite prominent in Diego Rivera’s Detroit Industry Murals at the Detroit Institute of Arts murals, commissioned in 1932. I tried to bathe my map in that blue, to represent Ford and the auto industry, encroaching on the city. As I worked, I was glad the media was forgiving. Connie Brown, the workshop leader, brought each of us a piece of Canson Opalux Translucent paper. Opalux is a heavy vellum-like paper, with a plastic consistency. It’s great for color pencil. I could erase ink and color pencil easily and rework it without damaging the surface. I re-colored the freeways that bleed off the top of the map at least twice. The scale also had a few incarnations. As usual, I found a couple of my spelling mistakes, in ink, and corrected those as well. The first incarnation of the scale. Too much. Use a piece of paper under your hand to prevent smudges. Although, smudging wasn&#039;t a problem. Beyond the derelict factories and crumbling churches are acres and acres of what used to be thriving residential neighborhoods. As the auto industry, and its related support industries declined, people moved away. Houses were left abandoned for one reason or another. They fell into disrepair and were “scrapped” for metal and other valuable materials. Many are left in collapsed state; many have been bulldozed or burnt. From the air, as we approached the airport, the empty blocks made an familiar patchwork that reminded me of farm fields. Traces of driveways and walkways can be seen in the grass. Trees and shrubs from yards thrive and grow over the odd step or leftover fence. Tree farms were started in the lots, just so they didn’t seem so empty. Community gardens and urban farms are springing up all over. When I visited, it was June, the trees were full and green and the surviving lawns covered the blocks in a green carpet. Honestly, it was quite lush, alive and inviting. But it was still a collection of empty lots that sometimes stretched for blocks and blocks. Just a house here and there, or a large concrete parking lot reminded you this was all houses at one time. Each line of type was drawn on marker paper for fit. Each line of type was penciled on the Opalux prior to inking. I wrote out this passage more than three times. Measure twice, cut once. Making the type fit. As I worked on the map, I continued to research, to check facts and assumptions. I couldn’t and didn’t want to put in all the streets accurately, so I generalized. In the process, the major streets are a bit off. The Motown Museum is on the wrong side of W Grand! (I left it there, because it would have oriented with the back facing out.) I looked up where the urban farm areas are. I had to double check where the Greek Town was, as I had inked it in the wrong place the first time. I decided to add the population to the story, and of course I had to look this up. I kept asking myself what is the map for? Mostly it is for me – I wanted to capture a trip that I took, about urban decay, but I didn’t want the map to seem too dour. 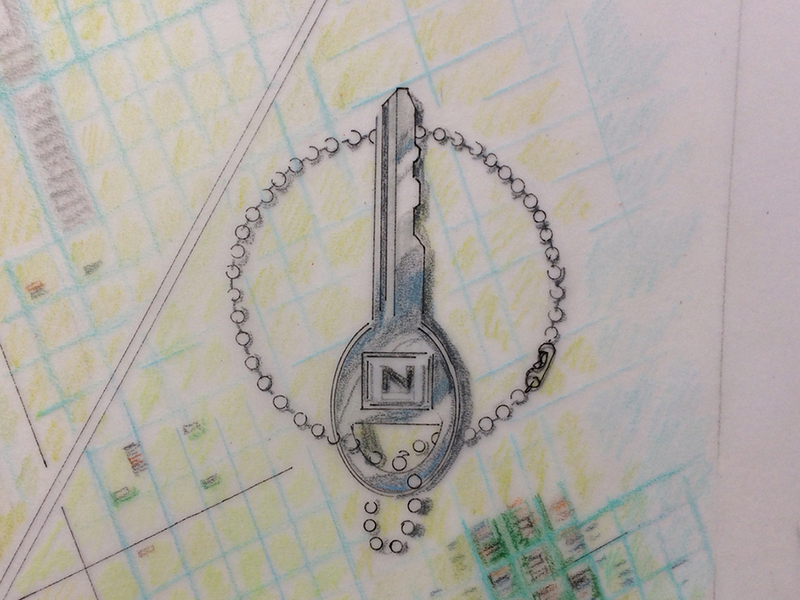 I realized I was mostly highlighting what might be seen as the negative aspects of the city, the abandoned buildings, empty lots and killer freeways. To be honest, that’s why I went to Detroit. I wanted to see this decay. The road map inspired cartouche on the unfinished background. 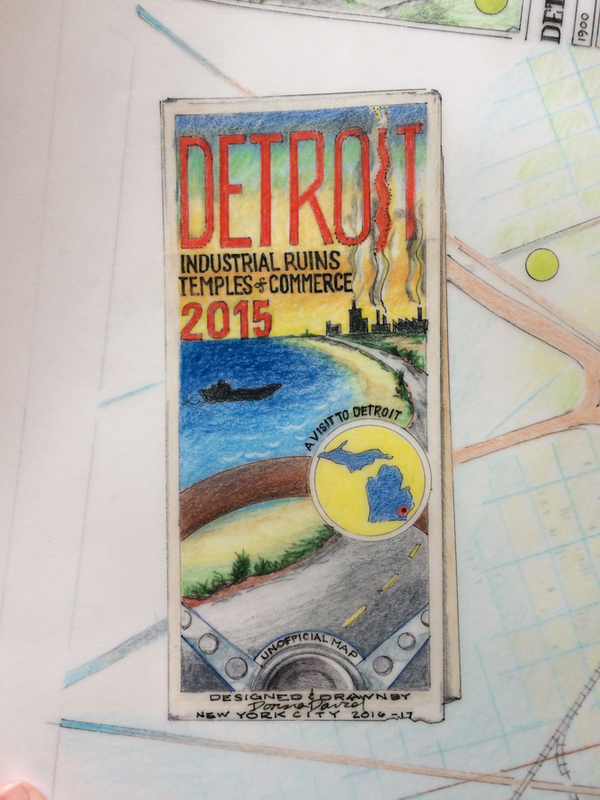 As I worked on the map, I started to remember charming things about being in Detroit. People drove very slowly through the city, down long empty streets. People were extremely friendly, with almost a Southern hospitality. 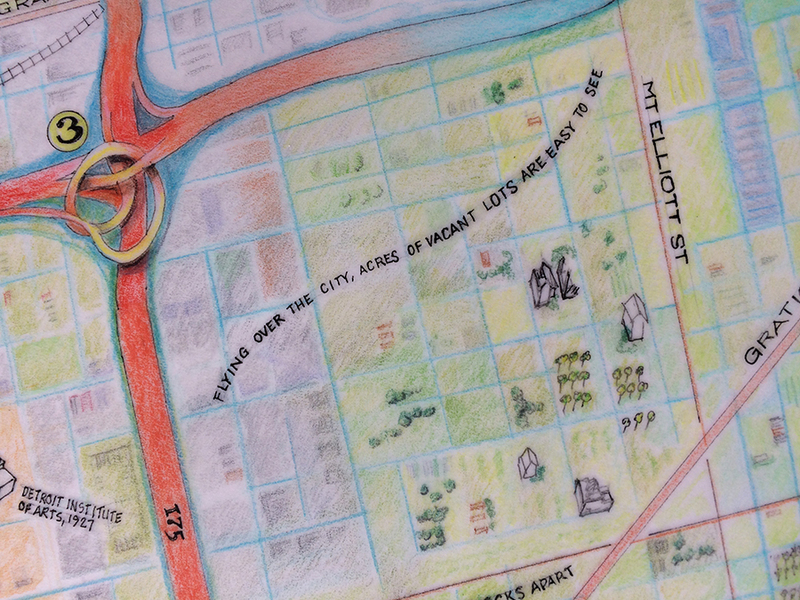 I recalled restaurants, streets, parks, buildings – things not originally on the map. All of this made up my impression of the city. I decided to add some of these memories as text on curvy lines, that wound through the city, slowly and deliberately, like all those slow drivers. The map is quite ambitious, but I’m happy with it. There was a point, where I thought I had gone too far, it was unbalanced and there was too much going on. Perhaps I should have limited the color palette? I continued to work on it a little each day. I adjusted colors, but also embraced the “excess” quality of it. It’s a good idea to let the work rest in your head before doing too much. It has been quite a while since I worked on a large piece like this. As I tell my students “trust the process” and I kept working. 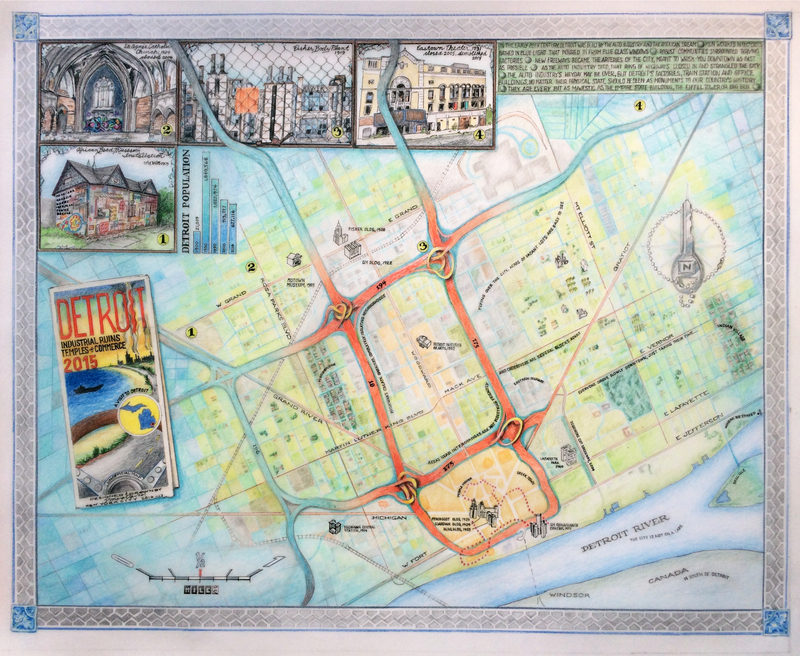 The map started out rather muted in Portland, but ended in Technicolor in Dublin! Maps always have a point of view. The map is a record of my overall impression of what I saw and also felt during that visit. I saw decay and I saw grandeur. These old buildings and factories are the Pyramids and Castles of America! They are not garbage. I loved Detroit, and briefly calculated how I could live there-but I remembered they still have a pretty substantial winter! Click here to see the first post about this map and the Map Workshop in Portland, Maine. All images enlarge with a click. Roll over the square images for a caption. This work is incredible. Obviously you got the lion’s share of artistic talent when they passed it out in our family. You have always been like that, I know. This thing with the Detroit Map has a quality to it that is hard for me to describe with my weak vocabulary. Lovingly eclectic is the best I can do although it is much more than that. You have talent, and it shows in this piece. Keep up the good work. This map was chosen as a “Map of the Week” by the American Geographical Society, June 15, 2017!